These Michaelmas Daisies are firm old-fashioned favourites in the cottage garden and the herbaceous border (and are also perfectly suited to the contemporary prairie style) flowering from late August through October. They have been grown in this country for over four hundred years; the earliest ones coming from Europe, whilst the larger proportion are natives of North America (these North American species have been renamed Symphiotrichum but many nurseries are continuing to list them as Asters). Aster novi-belgiae is the New York Aster (named after the Dutch settlement of the New Netherlands, later New York) and is not so much a species as a collection of hybrids. It has given rise to many good garden plants with brilliant colours (although it can be susceptible to mildew which may be kept at bay by keeping the plant well-watered and with good air circulation around the base of the stems). Many of the most popular varieties were bred by Ernest Ballard at his nursery in Colwall near Malvern, who started his commercial enterprise by accident. The story goes that when his gardener threatened to leave because of an overabundance of aster seedlings in his garden Ballard bought a field opposite his home to continue to grow them. One of those seedlings by chance had double flowers which Ballard named ‘Beauty of Colwall’ and sent to the RHS 1907 Aster trials where it won a first class certificate. 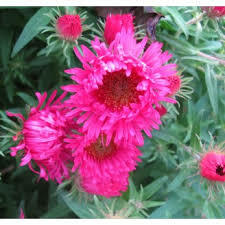 After his success Ballard started breeding asters in earnest, naming many of his favourites after family members, such as the lovely double blue Marie Ballard, and the double pink Patricia Ballard. Aster novi-angliae is the New England Aster, which is generally stronger and less prone to mildew, although it is less useful for cutting as the flowers tend to close in the evening. The most sensational variety (and my favourite) is ‘Andenken an Alma Potschke’ which translates as ‘In Memory of Alma Potschke’: it would be good to know who she was and if the plant with its intense pink flowers lived up to its namesake. There are many more fabulous asters such as A. frikartii ‘Monch’ (the first to appear) with large single pale lavender blue flowers and ‘Little Carlow’ which has masses of small single intense lavender-blue flowers, and they all provide a welcome splash of late colour, lifting our spirits like an Indian Summer.